A long-term alternative to war can only be built by popular movements in Iraq and Syria. These movements deserve our solidarity—not our bombs. 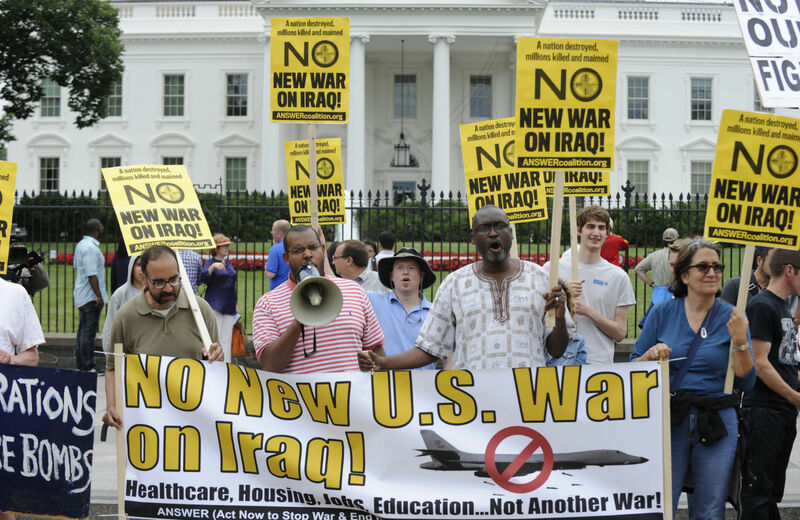 A June 21, 2014, protest against renewed US involvement in Iraq (AP/Sarah Walsh). The expanding US-led war on the so-called Islamic State, or ISIS, has largely fallen off the radar of US social movements. Many (but not all) who were active in anti-war organizing over the past decade have turned away from this conflict. The dearth of public debate is conspicuous, even as the US government sinks the country deeper into yet another open-ended and ill-defined military operation. The refrain “it will take years” has become such a common utterance by the Obama administration that it slips by barely noticed. There are many reasons for the relative silence in the face of this latest military escalation. I would venture that one of them is the sheer complexity of the situation in Iraq and Syria—as well as the real humanitarian crisis posed by the rise of ISIS, the many-layered power struggles across the wider Middle East and the difficulty of building connections with grassroots movements in countries bearing the brunt of the violence. But the answer to complexity is not to do nothing. In fact, great crimes and historic blunders—from Palestine to South Africa to Afghanistan—have been tacitly enabled by people who chose not to take action, perhaps because the situation seemed too complex to engage. When millions of lives are on the line, inaction is unacceptable. The task is to figure out what to do. The most important question to ask is this: Do we really think that the US military operation against ISIS will bring about a good outcome for the people of Iraq and Syria, or for US society? Is there any evidence from the more than thirteen years of the so-called “War on Terror” that US military intervention in the Middle East brings anything but death, displacement, destabilization and poverty to the people whose homes have been transformed into battlefields? But there are also many things to say “Yes” to. A better path forward can only be forged by peoples’ movements in Iraq and Syria—movements that still exist, still matter and continue to organize for workers’ rights, gender justice, war reparations and people power, even amid the death and displacement that has swallowed up all the headlines. Now is a critical time to seek to understand and build solidarity with Iraqi and Syrian civil societies. Heeding their call, we should strengthen awareness here at home of the tremendous political and ethical debt the United States owes all people harmed by the now-discredited war on Iraq and the crises it set in motion. “A rational observer of United States intervention in the swath of land that runs from Libya to Afghanistan would come to a simple conclusion: U.S. military action leads to chaos,” wrote scholar and activist Vijay Prashad a month after the bombings began. More than thirteen years on, there is no evidence that the “War on Terror” has accomplished its stated, if amorphous, goal: to weed out terrorism (defined to exclude atrocities committed by the United States and allied countries, of course). According to the Global Terrorism Index released by the Institute for Economics and Peace, global terrorist incidents have climbed dramatically since the onset of the War on Terror. In 2000, there were 1,500 terrorist incidents. By 2013, this number had climbed to 10,000. People in Iraq, Afghanistan, Pakistan, Nigeria and Syria suffer the most, the index notes. The so-called “good war” in Afghanistan, which is now entering its fourteenth year and has not ended, illustrates this failed policy (President Obama’s recent claim that the combat mission is “over” notwithstanding). In contradiction of the Obama administration’s “mission accomplished” spin, Afghanistan is suffering a spike in civilian deaths, displacement, poverty and starvation, with 2014 proving an especially deadly year for Afghan noncombatants. The Taliban, furthermore, appears to be growing in strength, as the United States forces Afghanistan into long-term political and military dependency with the Bilateral Security Agreement signed last September by Afghan President Ashraf Ghani. The Revolutionary Association of Women in Afghanistan is one of numerous civil society groups in Afghanistan that have no illusions about the US track record so far. “In the past thirteen years, the U.S. and its allies have wasted tens of billions of [dollars], and turned this country into the center of global surveillance and mafia gangs; and left it poor, corrupt, insecure, hungry, and crippled with tribal, linguistic, and sectarian divisions,” the organization declared in a statement released last October. The current crisis in Iraq and Syria is another piece of this puzzle. It is now well-documented that the US-led invasion of Iraq in 2003 played a critical role in fueling Al Qaeda in Iraq, which would eventually become ISIS. Emerging as part of the insurgency against the United States—and now thriving off opposition to the sectarian Shiite government propped up by Washington—ISIS did not even exist before the United States invaded Iraq. Its ranks were initially filled with Sunnis who were spat out by the brutal, US-imposed de-Baathification process, and later by those disaffected by a decade of negligence and repression from Shiite authorities in Baghdad. In neighboring Syria, the United States and Saudi Arabia backed anti-Assad fighters that were, as journalist Patrick Cockburn put it, “ideologically close to al-Qaeda” yet “relabeled as moderate.” It was in Syria that ISIS developed the power to push back into Iraq after being driven out in 2007. Ordinary people across the region are paying a staggering price for these policies. Last year was the deadliest for civilians in Iraq since the height of the US war in 2006 and 2007, according to Iraq Body Count. The watchdog found that 17,049 civilians were recorded killed in Iraq in 2014 alone—approximately double the number recorded killed in 2013, which in turn was roughly double the tally from 2012. And more than 76,000 people—over 3,500 of them children—died last year in Syria, according to figures from the Syrian Observatory for Human Rights. António Guterres, the UN High Commissioner for Refugees, recently warned, “The Syria and Iraq mega-crises, the multiplication of new crises, and the old crises that seem never to die have created the worst displacement situation in the world since World War II,” with at least 13.6 million people displaced from both countries. But instead of reckoning with these legacies, the US government has taken a giant leap backward—toward another open-ended, ill-defined military operation in Iraq and Syria. President Obama vowed in his recent State of the Union address to double down in the fight against ISIS, declaring yet again, “This effort will take time.” His remarks came just days after the United States and Britain announced a renewed joint military effort, and the Pentagon deployed 1,000 troops to Middle Eastern states to train “moderate” Syrian fighters. That comes in addition to the 3,000 soldiers ordered to deploy to Iraq, with more likely to follow. Meanwhile, the rise of Islamophobia in the wake of the Charlie Hebdo attacks is feeding war fervor abroad and at home. Meanwhile, Kurds are fighting and dying to beat back ISIS in both Iraq and Syria but are not even offered a seat at the international table. This was highlighted in the recent exclusion of Kurdish groups from an anti-ISIS conference in London of representatives from twenty-one nations. Furthermore, the ability of the US military—the most powerful in the world—to blow up and kill is not in question. But in a complex geopolitical arena, that’s simply not a valid measure of success. The histories of the Vietnam, Iraq and Afghanistan wars are tragic examples of the vast difference between killing a lot of people and winning a war. In addition to the crimes perpetrated by ISIS, US-backed and –armed Iraqi forces, sectarian Iraqi militias and “moderate rebels” in Syria are also committing brutal war crimes. And now, of course, Iraqis must contend with the return of a far more powerful fighting force guilty of numerous atrocities and war crimes across the globe, including torture, massacres, use of chemical weapons and cluster bombing of civilians in Iraq: the US military. None of this is to overstate the coherence of the US strategy in Iraq and Syria, nor even to confirm the existence of one. Since the bombings began in August, the United States has waffled and balked, going from support for “moderate rebels” in Syria to the announcement that it would create its own proxy force. The United States initially hesitated to militarily back Kurdish forces holding out against ISIS in the Syrian town of Kobani, and many people bearing the brunt of ISIS’s repression on the ground seem to doubt that the United States is seriously trying to stem the group’s advance. The US government has trumpeted its broad military coalition, yet seemingly turns a blind eye as its allies go on directly and indirectly supporting ISIS. In truth, the US and global publics are kept in the dark about what the US-led military coalition is doing, how long this war will last, where its boundaries lie and what “victory” means. Obama and Kerry have both indicated that the war on ISIS will take years, but Pentagon officials repeatedly refuse to reveal basic information, like what specific duties troops on the ground in Iraq are tasked with and who is dying under US bombs in Iraq and Syria. Just last December, a US coalition bomb struck an ISIS-operated jail in the town of al-Bab, Syria, killing at least fifty civilians detained inside, according to multiple witnesses. Yet while the Pentagon has demurred that civilians “may have died” during its operations, it has refused to actually acknowledge a single civilian death under its bombs. Some people in the United States have thrown their support behind the military operations, or at least not opposed them, out of a genuine concern for the well-being of people in Iraq and Syria. However good these intentions, though, all evidence available suggests that military intervention won’t make anyone safer. However, stopping the United States from further harming Iraq and Syria requires far more than simply halting the bombing and troop deployment. Washington must demilitarize its failed war on terror, not only by pulling its forces from the Middle East but by putting out the fires it started with proxy battles and hypocritical foreign policies—including its alliances with governments that directly and indirectly support ISIS, from Saudi Arabia to Turkey. In a recent article in Jacobin about the courageous struggle of the people of Kobani against ISIS, Errol Babacan and Murat Çakır argue that the United States, and the West more broadly, should start with Turkey. “Western governments must be pressured to force their NATO partner Turkey to end both its proxy war in Syria as well as its repression of political protest,” they write. “Western leftists could also work for goals such as the removal of foreign soldiers (as well as Patriot missiles) stationed in Turkey and demand sanctions against Turkey if it continues to support” the Islamic State. Meanwhile, it’s critical for the US left to step up its opposition to further escalation of the military intervention, including the upcoming White House bid to win bipartisan authorization. It will also be important to fight back against congressional efforts to sabotage diplomatic talks between the United States and Iran, which could embolden hard-line forces in both countries and open the door to further escalation in Iraq, Syria and beyond. A long-term alternative to war, ultimately, can only be built by popular movements in Iraq and Syria. While we in the United States are inundated with images of death and victimization, surviving grassroots efforts in both countries tell a different story. These countries are not mere geopolitical battlefields—they are hotbeds of human agency and resistance. Amid siege from ISIS, repression from the Iraqi government and bombing from the United States and its allies, popular movements survive on the ground in Iraq. Groups like the Organization of Women’s Freedom in Iraq are organizing emergency aid for women and families fleeing ISIS—while at the same time demanding US withdrawal, an end to Iraqi government oppression and reparations for the US-led war. The Federation of Workers Councils and Trade Unions in Iraq, meanwhile, continues to organize workers against Saddam Hussein–era anti-labor laws that were carried over into the new government and backed by the United States. Right now, the Federation, alongside OWFI, is mobilizing within the country’s state-owned industries, which are undergoing rapid privatization and imposing lay-offs, firings and forced retirement on hundreds of thousands of workers. Both of these organizations are collaborating with US groups—including the War Resisters League, the Center for Constitutional Rights, Iraq Veterans Against the War and Madre—under the banner of the Right to Heal Initiative to press for reparations for the harm from US policies in Iraq dating back to 1991. Along with damages from the last war and the sanctions regime that preceded it, their grievances include environmental poisoning in Iraq from the US military’s use of depleted uranium, white phosphorous, burn pits and more. Likewise, “There are still people and groups in [Syria] who are working through nonviolent means,” said Mohja Kahf, a Damascus-born author and poet, in a recent interview. “And they matter. They are quietly working for the kind of Syria they want to see, whether the regime falls now or in years.” As Kahf argued in a 2013 article, it is critical for the US peace movement to connect with movements on the ground in Syria, not only when they are threatened by bombings, and not only when they are used to win arguments against US-led military intervention. We in the US left must take a critical—if painful—look at the harm US policies have done to the Middle East, press for a long-term shift in course and seek to understand and build links with progressive forces in Iraq and Syria. The United States has a moral obligation to provide reparations to Iraq for its invasion and occupation. But these things must be demanded now, before Washington spends one more day waging a new armed conflict based on the same failed policies. Grassroots movements did offer an alternative to endless war following the 2003 invasion, and that needs to happen again. This dark time is all the proof we need that the United States must get out of the Middle East once and for all, and the pressure to do so is only going to come from the grassroots. Building international solidarity takes time, but you can get started today. Here are a few suggestions for productive next steps anyone can take. Direct Support. Donate to relief efforts on the ground in Iraq and Syria that are orchestrated by grassroots organizations seeking to help their communities survive in the face of ISIS. The Organization of Women’s Freedom in Iraq has been working to provide food and winter survival gear to people fleeing ISIS and maintains shelters in Baghdad and Karbala. Furthermore, they have created a “Women’s Peace Farm” outside of Karbala, which provides “a safe and peaceful community” for refugees, according to a recent OWFI statement. Direct donations to this work can be made at OWFI’s PayPal account. Learn. Now is a critical time for US-based movements to educate ourselves about both the histories and current realities of struggle and resistance in Iraq and Syria, as well as Afghanistan, Yemen, Pakistan and beyond. A forthcoming book by Ali Issa, field organizer for the War Resisters League, will be important reading for anyone interested in learning more about Iraqi social movements. Titled Against All Odds: Voices of Popular Struggle in Iraq, the book is based on interviews and reports highlighting environmental, feminist, labor and protest movement organizers in Iraq. There is also a great deal to learn from US civil society, including the powerful movement for black liberation that continues to grow nationwide. From Oakland to Ferguson to New York, people are showing by example that justice and accountability for racism and police killings will not be handed from above, but rather must be forced from the grassroots. This moment is full of potential to build strong and intersectional movements with racial justice at their core—a principle that is vital for challenging US militarism. The Stop Urban Shield coalition—comprising groups including Critical Resistance, the Arab Organizing and Resource Center, the War Resisters League and the Malcolm X Grassroots Movement—powerfully demonstrated the connection between domestic and international militarization when it kicked a global SWAT team, police force and mercenary expo out of Oakland last September. Ultimately, solidarity with Iraqi and Syrian people will require more than a push to end the US bombings, but long-term pressure to end US policies of endless war and militarism, in the Middle East and beyond. Building consciousness across US movements is critical to this goal. Pressure the US government. Grassroots mobilization can play a vital role in preventing lawmakers from charging into war. This was recently demonstrated when people power—including overwhelming calls to congressional representatives and local protests—had a hand in stopping US strikes on the regime of Syrian President Bashar al-Assad in 2013. Mass call-ins, as well as scattered street protests, also had a hand in preventing war hawks from passing new sanctions in the midst of talks with Iran last year. It will be important to closely track any Obama administration attempt to pass explicit authorization for the war on ISIS, as well as congressional efforts to sabotage diplomacy with Iran. We must strive alongside them. Members of War Times/Tiempos de Guerras contributed to this report.